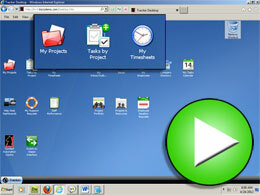 Tracker Suite is a comprehensive package of Web enabled, Lotus Notes project management software tools designed to maximize your office efficiency by simplifying and accelerating vital business processes: project management and job costing, help desk services, expense tracking, time reporting, resource management, CRM, sales force automation and more. We are also pleased to offer an Outlook project management solution, TrackerOffice. Leverage your Notes IT resources. Source code is included with licensing. Select the applications you want to cost-effectively assemble the solution you need. Tracker Suite for Projects - Automate the key functions driving the business services lifecycle, reduce labor costs and improve the execution of projects all within Lotus Notes. Tracker Suite for IT - Provide IT managers and CIOs tools to manage projects, automate support services and regulate assets for improved productivity and efficiency. Tracker Suite for HR - Provide HR personnel with a central data management system, reducing HR workload and improving employee relationships through better communication, workflow, and information availability. Tracker Suite for Sales - Automate your sales force easily and efficiently with tools for effective, Web based marketing and lead generation, online prospect files, and security for confidential data. TrackerSuite.Net is a Cloud based solution that integrates with email systems, including Lotus Notes. Watch our TrackerSuite.Net Flash presentations to see how TrackerSuite.Net modules simplify Projects, Time, Support Services, Purchasing and more.